On June 26 the East Bay Green Corridor partnership held its second annual summit at the Oakland Museum. Part one of this article (July 7) began to chart the gap between the partnership’s rhetoric of shared green prosperity and its reality of disparate power and access. Part II tells how, in the name of green economic development, three of the consortium’s members — UC Berkeley, Lawrence Berkeley National Laboratory and the City of Berkeley — along with a formidable developer, are working to dismantle the industrial zoning that has sustained West Berkeley’s diverse community and economy, and what their effort bodes for the region’s future. The City of Berkeley isn’t waiting for new zoning to foist an outsized biotech project on West Berkeley. On July 2 planning staff urged the Zoning Adjustments Board to approve Wareham Development’s application for a 4-story, 92,000 square foot spec lab at 740 Heinz (across the street from Magic Gardens nursery). The building requires two variances: one for its 74-foot height (existing allowable height is 45 feet), the other for its floor-to-area ratio of 4 (the existing allowable FAR is 2). That view was shared by developer Michael Ziegler, the owner of the nearby Temescal Business Center, whose tenants include Xoma pharmaceuticals. “Four stories,” Ziegler told the ZAB, “is out of scale … and not required to make it a profitable project … If you grant these variances, you’re aggrandizing one property owner over another” and “hijacking a public [planning] process that’s been going on for two years.” The ZAB majority turned a deaf ear to Ziegler and the eleven other West Berkeley neighbors and businesspeople who spoke at public comment, all in opposition to the project; Wareham’s application was approved on a 6-3 vote. On July 7 the city council certified the ZAB’s action and set a public hearing on the project for its July 23 meeting. Quoting Cohen by name, Wareham partner Chris Barlow repeated that remark verbatim to the ZAB on July 2. The citation was hardly fortuitous; Wareham has extensive ties to both UCB and LBL. Though Wareham’s office is in San Rafael, most of the firm’s 4 million-plus square feet of property is in the East Bay, with the bulk in Berkeley and Emeryville and most of the space leased to “life sciences” tenants. The parcel at 740 Heinz is surrounded on three sides by Wareham’s 15-acre, 500,000 square foot Aquatic Park Center. The Center’s tenants include Bayer Pharmaceutical, Xoma and the Berkeley West Biocenter, an outpost of LBL. 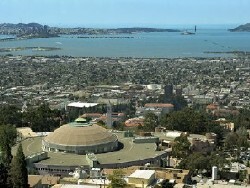 Wareham’s numerous Emeryville tenants include the two companies that UCB Professor of Biochemical Engineering Jay Keasling cited in his keynote speech at the June 26 summit as examples of green tech spin-offs from Cal and the Lab that have stayed in the East Bay: Amyris Biotechnologies and the Joint BioEnergy Institute. At the summit, nobody on the dais mentioned Wareham, but the firm was discreetly represented by a highly produced brochure lying on one of the display tables. Such subtlety was nowhere in evidence at the Berkeley planning commission’s February meeting, where Barlow lauded “flexible” zoning and the benefits it would purportedly bring the whole city. But the most outspoken supporter of zoning “flexibility” is Corridor chair Berkeley Mayor Tom Bates. Like his city’s staff, UC/LBL’s Cohen and Wareham’s Barlow, Bates presents such deregulation and the attendant proliferation of biotech labs as the necessary condition of future prosperity. Unlike them, he openly concedes that the changes they all seek will force industrial businesses — that is to say, businesses engaged in the production, distribution, repair and/or recycling of things—out of Berkeley. Bates’ nonchalance might be a sign of regional solidarity, wherein losing a solar technology manufacturer to a neighboring municipality looks like sharing the wealth. Here’s a more plausible interpretation: The Berkeley mayor is actually relieved to see production jobs leave his town, because he thinks they’re doomed. In March 2005 Bates advised the city council that “[w]e can no longer sit back and say we have to have manufacturing here, when manufacturing is closing.” Many would agree. If they’re right, then dismantling Berkeley’s industrial zoning is the only sensible course, and sending industrial enteprise to neighboring cities is like dumping garbage, not sharing wealth.